Looking for a quick way to make a low country boil? 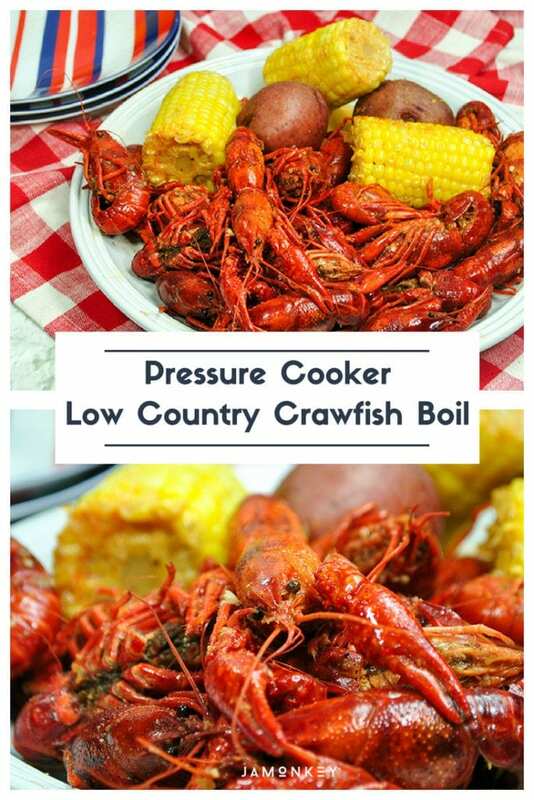 You have to try this crawfish boil in the pressure cooker! With a blend of cajun spices and hot sauces, this dish is a crowd pleaser. Also, check out our review of the Mealthy MultiPot 9-in-1 Pressure Cooker and enter to win one for yourself! 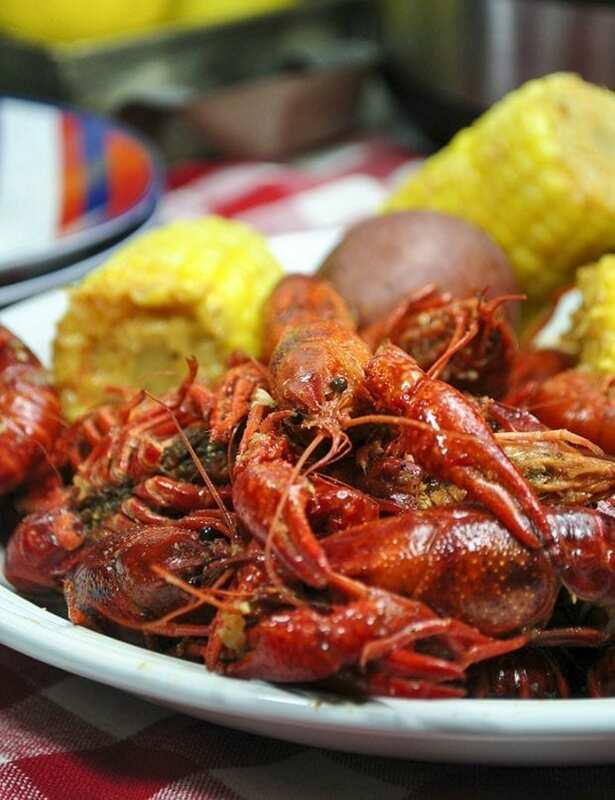 Prep your crawfish ahead of time so that it is well seasoned. It isn't a true low country boil without some heat! Use the Sauté feature to make the sauce. This setting starts working fast so make sure you are stirring and mixing. Remove from the pot and set aside. Place the trivet into the bottom of the pressure cooker and place the corn and red potatoes on top. 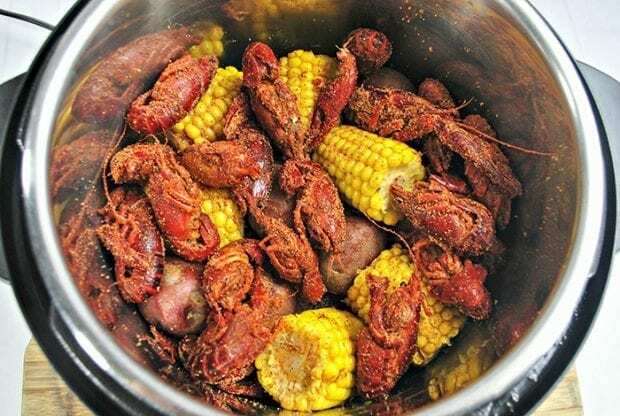 Fill with water and crawfish boil seasoning mix. Pressure cook for 5 minutes and then do a quick pressure release. 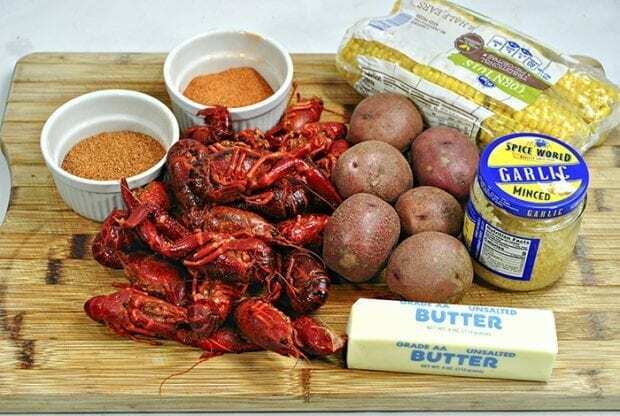 Next, add in your crawfish, re-seal and cook on high for 3 minutes. After another quick pressure release, remove the lid carefully and in the cajun sauce you made earlier and stir to combine. Enjoy immediately! We were sent the Mealthy MultiPot to review and giveaway. All opinions are my own. This post contains affiliate links. We were sent the new Mealthy MultiPot 9-in-1 Pressure Cooker to test out and I have to say I'm quite impressed. My first multipot was an Instant Pot Duo 6-in-1 and I've loved using it for all types of recipes. 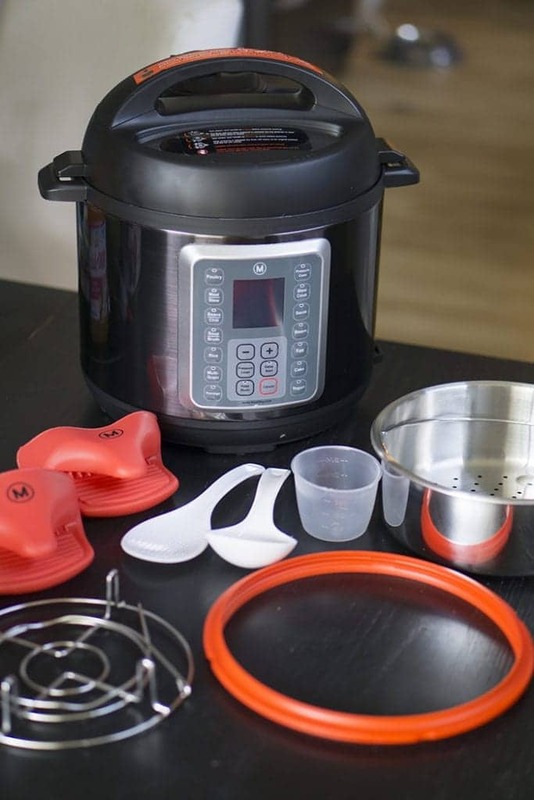 I was able to replace a lot of additional small appliances because of the multipot so I jumped at the chance to review the Mealthy MultiPot 9-in-1 because of some of the added features and accessories that come along with the appliance. The steam basket is one of my favorite accessories because it allows you to cook multiple items at the same time. I'm a big fan of cooking my veggies while the meat is cooking. The other thing I love about the Mealthy MultiPot is the cooking progress indicator. It shows you where in the cooking process you are which is handy for pressure cooker settings. The Mealthy MultiPot is $50 cheaper than the comparable Instant Pot and comes with a ton of accessories. It works exactly the same but you get more features and accessories for a lot less. 5 drops of hot sauce. 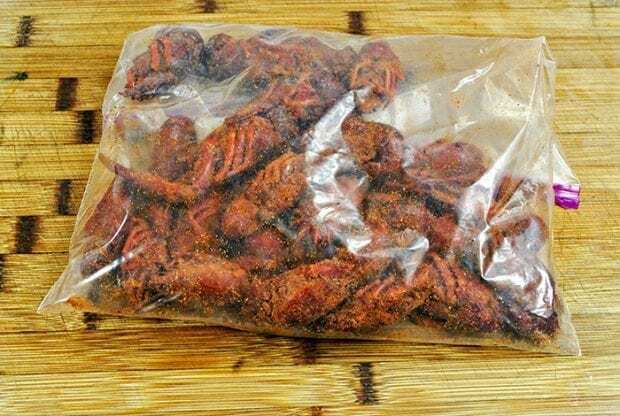 Place your crawfish in a plastic zipper bag with cajun spices and seal. Place in your refrigerator for 4-5 hours. Set to sauté and add the butter, and minced garlic and stirring often. Add all other spices mix to combine. Saute for 5 min. Remove from pan and set to the side. 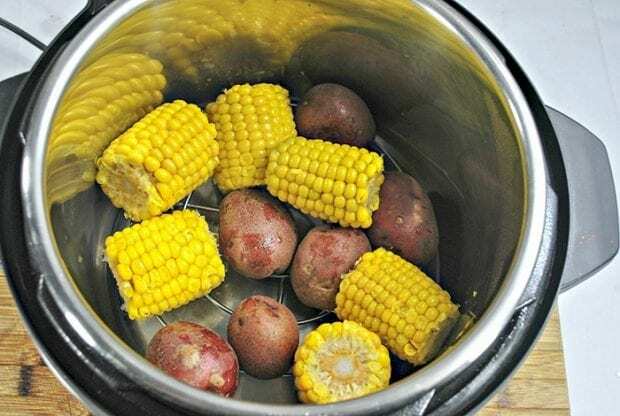 Put the corn, and red potatoes in the pot and cover with water. 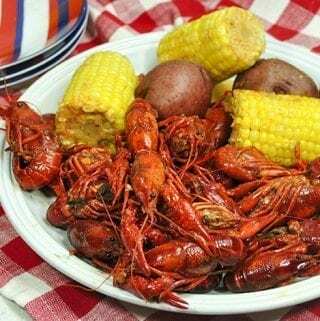 Add in Crawfish Boil Mix. Set your MultiPot to High pressure for 5 minutes. Once your MultiPot is done, perform a Quick Pressure Release and open the lid carefully. Check to ensure the potatoes are cooked. 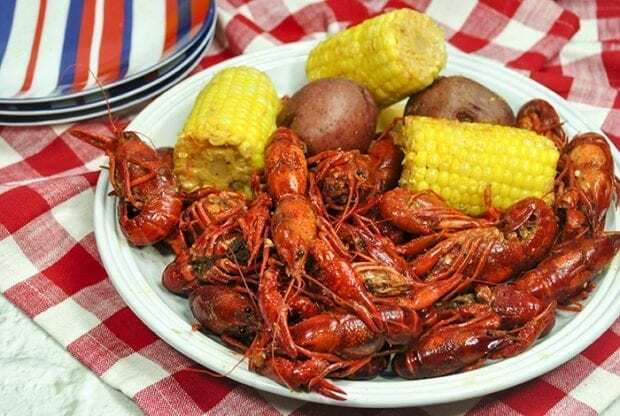 Throw in your Crawfish and stir. Re-seal the MultiPot and set to high pressure for 3 minutes. Add in your garlic butter spice mix to the MultiPot and stir to combine. I would LOVE to try the yogurt setting! Never tried a pressure cooker so looking forward to trying that setting- esp for days I forget to take something out of the freezer for dinner ☹️??? This is my favorite aspect of pressure cooking. I can throw in frozen food and it comes out great! We have never used a pressure cooker before, but the cake maker feature is what I am most interested in. I’m kind of terrified to try making yogurt. seems like I would make a mess! I love the steam basket! The cake maker option or the yogurt! Your low country boil looks delicious! I would love to use the pressure function…for beans. We like to eat a lot of rice, so I would like to try the rice setting. The cake setting would also be one that I would be interested in trying. I want to try the cake maker setting. One toolto cook sweet and savory is remarkable. I’m most excited to try the Cake Maker setting. Thanks. I would like to try the “rice cooker” setting. There are a lot of things I’d love to make in the MultiPot, but I’m especially looking forward to trying the yogurt setting! I don’t have a pressure cooker, so I would use it for that. I am most excited to try the pressure cooker setting because I heard it cooks food quicker and keeps meat moist! Would like to try the slow cooker on this. I would love to try the rice cooker setting! I would like to try the Pressure Cooker setting — I’ve never used this before, I’m ready to experiment. The yogurt setting is something I would definitely try! I’m most excited for the Slow cooker setting. I do not have one or have used one before so I would love to have the cake feature. I think that would be cool. But honestly I would love the cooking part of it. I really want one of these so things can be much easier at home. I am really interested in the sautee and the steam settingd of this. It’s super basic, but I really need a slow cooker, haha. The other settings would be super fun to play around with, but I know that if love having a slow cooker again. I am most interested in the pressure cooker setting. I would love to try short ribs in it. I would really like to try the steam function. I’m looking forward to trying the pressure cooker setting. I want to make shredded pork tacos in the cooker! I have never used a Mealthy MultiPot but am very excited to try the cake maker option. I am most excited to try the pressure cooker setting. I have never had a pressure cooker and anything that will help dinner cook faster is the setting for me. I want to try Slow Cooker. This product sounds so exciting, so many uses! I’m a cake freak so trying to make a cake in it would be cool! I am most excited to try the pressure cooker setting because I need to cook meats quicker! I would definitely test out the cake maker option! I would like to try the slow cooker setting. I’m looking most forward to the Cake option! I would love to try the steam basket setting. I am most excited about the pressure cooker setting. I want to prepare healthier dishes and side dishes. I would use the rice cooking mode. I want to use the Pressure cooker setting first. I’d love to try all the settings! BUT, I didn’t realize it had a yogurt making setting too! I love making homemade yogurt but it has been tricky keeping it consistently warm enough, yet not too hot. So the yogurt making setting would be at the top of the list for me!